It would seem, without fail, veggie burritos almost always disappoint. The filling is often flavorless, chocked full with (refried) beans and sautéed onions/peppers that are heavy on the cooking oil. For the most part, I steer clear of ordering a burrito at a restaurant. But on occasion, I crave a burrito. This filling is similar to that of the stuffed chiles I posted on Monday (mainly the spices). It’s my new favorite blend that works really well with so many different vegetables. I was done photographing and half-way through eating this burrito before I even realized I forgot the cheese and greek yogurt (making this vegan!) The flavors are so awesome, I didn’t even notice. And of course, the homemade tortillas help put this burrito over the top. I’ve talked before about my love Einkorn flour and in the case of these tortillas, the einkorn flours helps create a soft dough that rolls out into perfect (slightly oddly shaped, if you are me) tortillas. 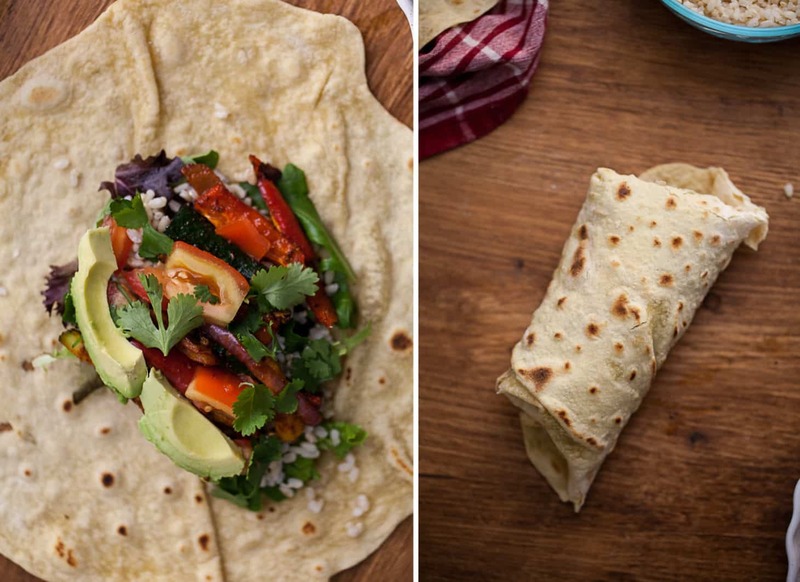 Plus, these tortillas are really not as much work as one might think! Combine 1 cup einkorn flour, olive oil, water, salt, and baking powder in a bowl. Stir until dough comes together and let rest for 10 minutes. If after 10 minutes dough is still sticky, add 2-4 tablespoons of einkorn flour. Dough for tortillas should be soft but not stick to your hands. Divide dough into 4 pieces. On an einkorn-floured surface, roll each ball into a thin 8-10” circle. Heat a large (large enough to cook the tortilla) skillet over medium low heat. Add tortillas to skillet and cook until tortillas puffs slightly and is forming light brown blisters. Flip and cook for another 30-60 seconds. Remove from skillet and wrap in a damp cloth. Continue with remaining tortillas. While making tortillas, preheat oven to 375˚. Cut zucchini and red pepper into 1/2” thick by 2” long strips. Cut onion into slices and combine with zucchini and pepper along with olive oil and spices. Toss until vegetables are well coated. Roast for 15-20 minutes until zucchini is tender. Once zucchini and tortillas are done, assemble. 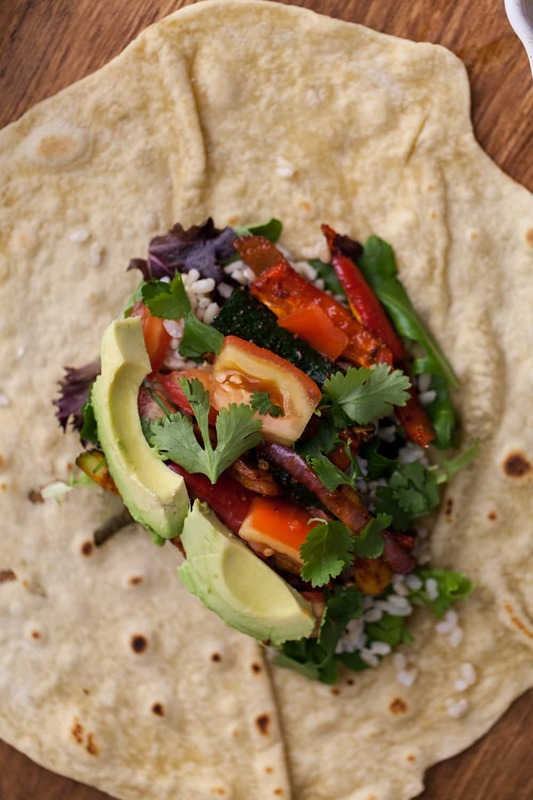 Lay the tortillas flat and layer lettuce, brown rice, zucchini mixture, and any other choice of filling. Roll and serve. Left over tortillas can be frozen. To reheat, wrap in a damp towel and stick in a 200˚ oven until warm. My favorite burrito filling is definitely pulled pork! My favorite filling is spiced beans, brown rice, and avocado! I like things that sound fresh and unique. Avocado is a must, and pickled veggies (especially carrots) are a unique and delicious addition! My favorite burrito filling has to be avocado when available! It ties everything else together. I love caramelized onions as well! Sweet Potato and black bean is my favorite burrito flavor bar none, and it is (of course) greatly enhanced with avocado. I also am a fan of breakfast burritos, but that’s a whole other animal entirely. Hummus & grilled veggies. Salsa verde, egg, & seasoned potatoes, Almond butter, bananas, almond slivers & honey. Harissa, pork, grilled zucchini & Israeli couscous. I like grilled tofu strips or BBQ tofu nuggets, I also LOVE avocado and all sorts of fresh veggies, black beans and pico de gallo. My favorite burrito filling is either spicy rice and beans or sliced steak, rice and caramelized onions. I like Jovial Foods on Facebook! My favorite burrito ingredients are shredded beef and avocados and spicy roasted sweet potatoes, black beans, with cojita cheese. You have me craving a burrito so bad right now! I love cilantro lime rice, black beans, tomatoes and a little avocado! Yum! I love burritos with eggplant, my family’s delicious beef and black beans! I love just putting a bunch of peppers in all by themselves. Homemade tortillas, totally worth the extra time! 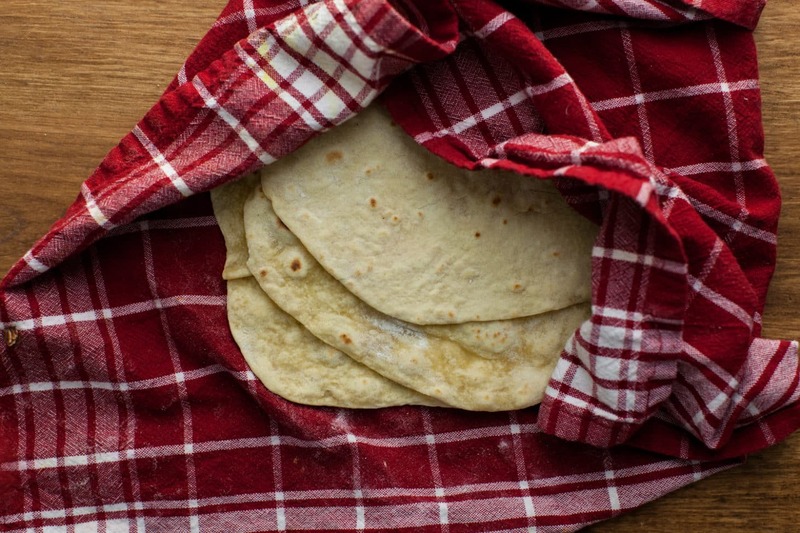 Would love to try using einkon flour… I find that my homemade tortillas get hard if they aren’t eaten immediately. I am hooked on burritos with sweet potatoes and black beans! These look spectacular! 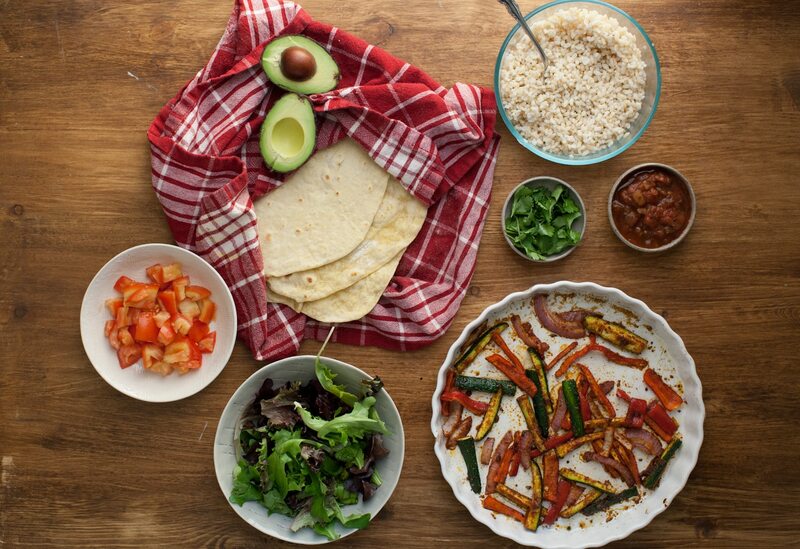 My favorite burrito filling – grilled veggies, lots of salsa and guac. Maybe some creamy cheese for good measure. I was just recently introduced to Einkorn, and I love it! My favorite burrito fillings would have to be chipotle sweet potato, black beans, & avocado OR grilled veggies, pinto beans, & guacamole. Olé! My favorite burrito filling is homemade refrieds, topped with sauteed shredded carrots and zucchini and chopped peppers and onions (ideally carmelized red onions). Oooh I LOVE avocado and black beans within my burrito. And spicy salsa!! Following jovial on Twitter (and you!)! The best burrito filling..cilantro. Hands down. Icing on the cake. Delish! I’ve been wanting to try baking with einkorn! I buy Jovial’s einkorn cookies all the time and they are awesome. My favorite burrito fillings are grilled zucchini and corn, homemade pinto beans, pico de gallo, and plain yogurt (rather than sour cream). And Tapatio hot sauce of course! Black beans with garlic, cheese and guacamole. I made burritos last week with filling that sounds very similar to this recipe, with black beans but without the rice. Does that make it a taco instead? Either way, they were really, really good. Spicy and smoky cheese and avocado to top. my favorite filling is black beans, corn, tomatoes, avocado, and grilled onions and peppers!! I love filling burritos with leftover lentil chili and lots of guac! I love beans and roasted veggies with either a vegan queso or Daiya cheese! Yum! Thanks for the awesome giveaway! Love my burrito with lots of avocado, of course! Fresh pico de gallo and some queso fresco as well. I love having a little cilantro lime rice and lightly sautéed onions and peppers in mine. Oh, and can’t forget the fresh salsa! Roasted Jimmy Nardello peppers from my garden, with avacado, lots of cilantro, a bit of our local goat cheese and I’m devouring them like mad. we like our burrito filling spicy, so I roast the black beans, sweet corn, tomatoes, onions, red & yellow bells, and mince some jalapeno, cowhorn peppers or whatever hot peppers I have from the garden, spray on some olive oil and roast away. i like barbecue pulled pork with cotija cheese OR black beans, corn, and avocado with pepper jack cheese. My favorite is beans and cheese! My favorite burrito filling is avocado, spinach, and sundried tomatoes! So yummy! I love sweet potato and black bean burritos!! Since I’m a native New Mexican, my favorite burrito ingredients are either green or red chile. Either go amazingly well with beans (black or pinto), rice, calabacitas, avocado, cilantro, cheese, etc. It’s super versatile! I know it’s usually just used for flair, but I love cilantro in my burrito. Like, A LOT of cilantro. Not just paltry “flair” amounts. I’ve always wanted to make my own tortillas! Yum! I love filling my burritos with quinoa, black beans, cilantro, onion, garlic, cumin, tomatoes, and spinach. YUM! Love shredded chicken with avocados, tomatoes and cheese! I like Jovial on Facebook too! So pretty!! I love a GOOD flavor veggies burrito and of course yours looks killer! Some good beef simmered in tomato sauce with cumin and oregano – absolutely my favorite base… But all these other suggestions sound phenomenal as well. Thanks for the tortilla recipe! Absolutely ANYTHING sautéd with garlic, onion and jalapeno! Okay so I REALLY need to try that spice blend! There are so many roasted veggies with it in my future. have never had a burrito so no favorites. My particular favorite is sweet potato, hummus, caramelized onion, assorted raw veggies, and kale! Yum. I love black beans and avocado! 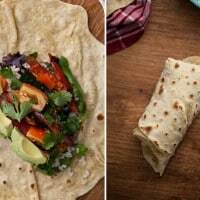 Love this wholesome healthy buritto!! Pinned. I love filling my burritos w/ chargrilled chicken, homemade salsa, and grilled veggies, especially grilled bell peppers. I top it off with a little cilantro and a good spread of Greek yogurt and it is a winner! Whatever is in my burrito is topped with lots of avocado! There is a spinach and mushroom burrito at a local restaurant that I really love. Of course, you can’t go wrong with black beans, brown rice, fresh salsa and avocado. I love black beans, black rice (whole foods), roasted sweet potatoes, salsa, cilantro and avocado. Yum! I like to make breakfast burritos for my husband, with scrambled eggs, cheese, and roasted potatoes on homemade tortillas. Yum! 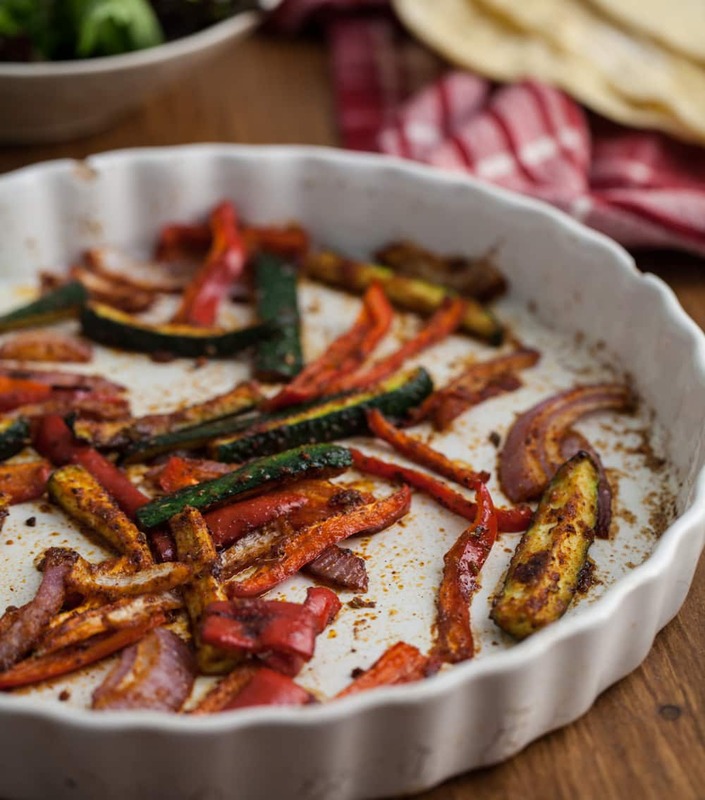 Definitely roasted veggies with a mix of flavors/textures!! These sound amazing. Roasted veggies for the win! My favorite burrito filling is grilled tofu, pico de gallo and lots of cheese! I love black beans and goat cheese. I love fresh, roasted veggies and salsa in my burritos! I like refried black beans and quinoa. Thanks for the giveaway! Black beans kale shallots garlic & monterey jack!! maple & soy marinated grilled tempeh with black beans, avocado, red onion, cilantro and tomatoes! I always start with a grilled fillin’ (usually tofu or portabellos), and then add plenty of brown rice, spinach, salsa, and fresh avocado to round things out. I Follow Jovial Foods on fb too! I like shredded carnitas, beans and rice in my burritos. Do you suppose I could use coconut oil? The kind that has been processed as to not add flavor? Hi Lauren, I think that would work! I LOVE the idea of using spiced zucchini and corn as a burrito filling! Yummy! 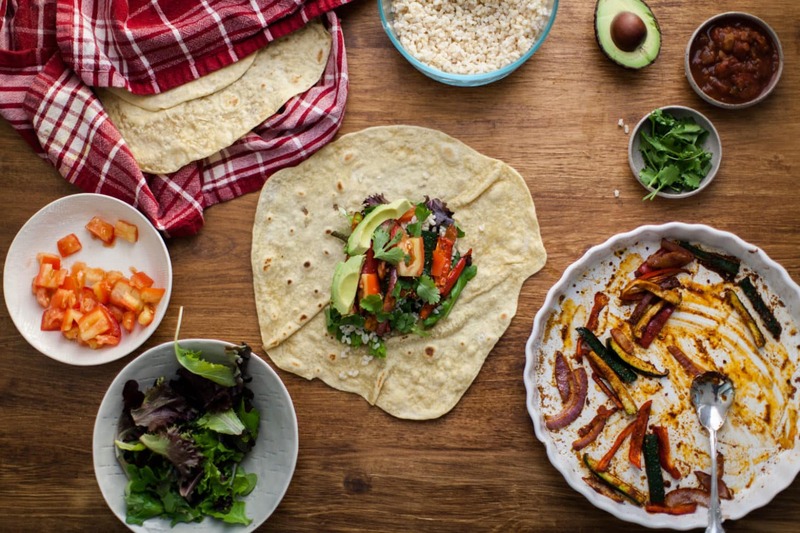 We often make veggie burritos and fill them with lentils and roasted cherry tomatoes. Thanks for this awesome recipe!